Based on the call data generated in the UC system, UC-Analytics by aurenz offers different evaluation options. It is user-friendly, fast and flexible to use the web to display your personal reports of corporate communication on the integrated dashboard. Ensure your service quality and use the reports and analyses to optimize your processes. Peak time reports are excellent for planning resources. Turn static hunt groups (i.e. support, head office, etc.) into extendable DynamicTeams. 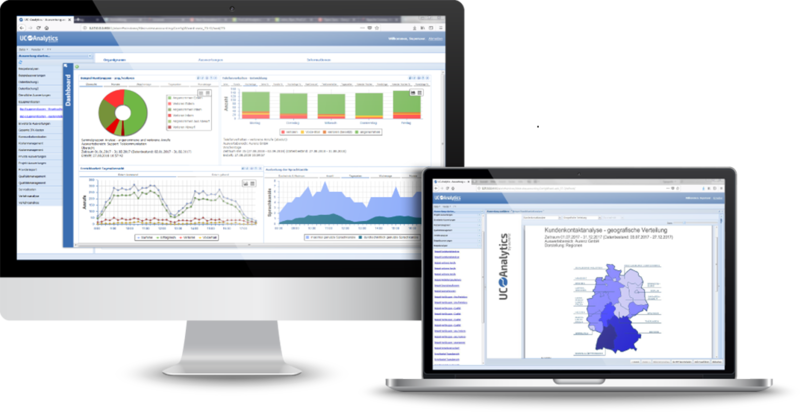 In addition to reports and analyses, the UC-Analytics offers the full scope of a modern call accounting solution. This way additional costs (other than call data) such as working hours, equipment costs (devices) and services can be distributed and charged according to the originator. Identify how many calls were accepted or lost and make sure to optimize your hunt groups. Determine your actual need for voice channels. Identify bottlenecks or overcapacity and manage your resource planning. Increase your service quality based on the accessibility analyses. How long do the customers stay on the line? Create and configure drop groups properly. Our analyses and reports make the Unified Communication graphically visible. Optimization potentials are revealed and the service quality further improved. It is easy to measure the required number of voice channels. After the analysis, adjust the SIP connections as needed and make sure to always be available. You are constantly on the safe side with the integrated alarm for defined events. There is an immediate notification about the event via for instance e-mail so that you are able to take quick counter measurements. Static hunt groups (e.g., support, head office, etc.) become dynamic hunt groups, expandable if necessary. When creating and processing all data protection requirements are always taken into account. If you are not familiar with our software yet, do not hesitate to download our current demo version. It will convince you and your customers.